(22 January,2019), Houthi militia stormed the house of Abbas Al-Nahari, a parliament member and a leader in the Islah party, in Sanaa on the grounds that he supported the legitimate government. (23 January,2019), The MASAM Demining Project says five demining experts were killed by an accidental explosion in Marib city while attempting to transport mines and explosives. (24 January,2019), A civilian was killed and others injured by Houthi militia shelling at Thabit Brothers Industrial complex in Hodeidah province. (25 January,2019), 5 displaced persons were injured, including 4 children, in the targeting of an IDP camp by Houthi militia in Al-Khokha in Hodeidah governorate. (26 January,2019), A girl was injured by a Houthi militia sniper in Al-Jah area in Hodeidah and another was killed after gunmen fired at a water station in Al-Manakh neighborhood in Taiz. (27 January,2019), A child was injured by the explosion of a landmine planted by Houthi militia in Hayes district in Hodeidah province. 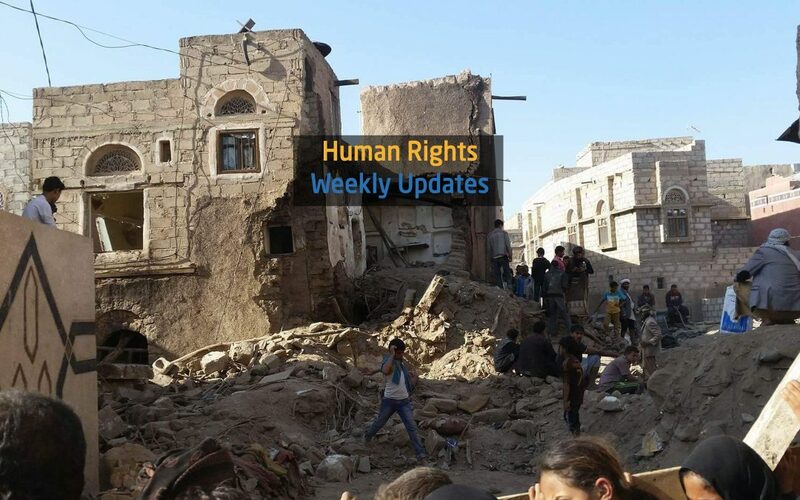 (27 January,2019), SAM Organization for Rights and Liberties recorded in a report more than 100 cases of assassinations in Aden which targeted security men, leaders, soldiers, imams of mosques and activists between August 2015 and October 2018. (28 January,2019), Health office has recorded 3 deaths and 394 cases of malnutrition in Zenzibar and Khanfar districts in Abyan province during one week.